January | 2017 | Illuminations Now!! Here’s another Facebook find that I totally love and pass on to all of you! There is a subject that we feel we must address at this time. This is a period of very chaotic energies. We want you to know that you would be better served to keep yourselves focused in ways that would keep you from interfering with those outcomes that you have dedicated yourselves to achieving. Now, what do we mean by that? What are we seeing that you, from your viewpoints, do not? Das Bewusstsein des Herzumfangens, das Fühlen des Innen nun in alle Bereiche des sichtbaren Lebens hinein auszudehnen, bringt sich mehr und mehr voran, macht sich Luft, nimmt sich Raum. Befreit von allen Erwartungen an das Aussen, vertraut das Innen auf die Führung der Herzbewusstseinsebene. Geklärt von allen Imprints der Trennungs- und Abspaltungsmanöver der Illusion der 3 D Wirklichkeit, kreiert die individuelle Seelenblaupause eines jeden Wesens genau die Sequenz, die das gleiche Resonanzfeld des Innen im Aussen als Spiegelung/Reflektion im Sein verankert. Die Zentrifugalkräfte des Herzens, im Aussenden der tonalen, symmetrischen Resonanzfrequenz der individuellen Seelenschwingung für das Einbringen der Ganzheit auf allen Ebenen, erneuern, stabilisieren und transzendieren die letzten Schichten aller Anhaftungen und Abhängigkeiten. Seid Euch bewusst, dass über die innere multidimensionale Bewusstseinsarbeit Eures Herzkristalls bereits alle Energie- und Resonanzfelder des Innen geklärt sind, die äußeren Ebenen hier bereits einbezogen wurden. DIVIDE AND CONQUER is yet again being used to destroy humanity. The invaders who entered your Earth a long time ago, use it over and over again to destroy you. All this anger, marching, and shouting from the rooftops, is giving your ENERGY to your oppressors, who will use it to destroy you. This ANGER provides massive energy that is all used against you. You play right into the hands of your enemies, over and over again. They play you like a violin. Will you ever learn? You had a choice: Hillary Clinton and World War III, or take your chances with Donald Trump. The people made their choice. They do not want to lose any more of their young men to needless wars. It is surely time for the human races to learn to live with each other, no matter what skin suit they wear at this moment in time. Divided you fall. This is the very reason your oppressors created so many religions. They did so in order to set you against each other. You have seen this work countless times throughout history. It matters not what name you give the differences; race, creed, colour. They are all used against you to create ‘reasons’ for war. In reality, it is the elimination of the human race. Why do you not see this? Look at your history. It is all there: a continuous battle for survival. I plead with you to work with what you have. Make an effort to create peace and harmony. Do not glorify war. It is never justified. Those who seek war are the enemies of humanity. There are many in your world who have sold their souls for fame and fortune. They stupidly believe they will have it all. Look at these same people as they age. They are fearful, sad, and lonely, because they know that they will be discarded without notice. They will have to face death alone and fearful. One moment they seem to have everything, then it is snatched from them. They all face the same fate. You have seen it happen so often, and yet there are still plenty of others who are ready to sell their souls, too. This is all part of the mind control. Once you sign up, they own you, and you are never free again. This is why they insist that fame and fortune is what you must strive for, rather than a life well lived. The enemies of humanity control your governments, your education, your health, and your lives, in every possible way. You have been coerced into this way of thinking by television and films. You are only now becoming aware that you are in fact NOT FREE to explore your true history. Everything has led you to a false idea of who and what you are. Those of you who have awakened have had a real shock when you realised just how much your life is controlled. Their plans had succeeded almost 100%; however, Brexit and Mr Trump were shocks that they were not prepared for. Their plans are now being upgraded to deal with these hitches. In the meantime, they are using your ANGER as an energy source to use against you. You are assisting them to eliminate you. Think before you act. Ask yourself, will my actions harm anyone? Laws are being brought in that will render you even more helpless to defend yourselves and to live your life as normal human beings. All your freedom is being taken from you, while you are busy demonstrating against Mr Trump. You are unaware of all that is being done to shut you down. Look at what is important to life on Earth and stand up for it. Politics is a very dirty and dishonest business. Governments do not serve the people. THEY ARE PLACED IN POWER to remove what little control you have over your lives. They poison your air, food, water and way of life, while all the time telling you that they serve you. Believe me, THEY ONLY SERVE THEIR MASTERS. At this moment in time, you are actually fighting for your very existence. There is so much stacked against you. I have told you, many times, that together, the 99% cannot lose. Look at how divided you are right now. This is exactly what your oppressors want and you are giving it to them. You are your own worst enemies. My dear wife is trying to assist those who want to change life on Earth for the better. She is being attacked for stating the truth, for trying to prevent the World War that Hillary Clinton wanted. Many of you were blindly rushing into it. My wife wants to assist those who can deliver free energy to you. This can be done sooner than you think. There are good people with good intentions who are working towards improving the quality of life on Earth. This is what all of you should support with your energy and intention. It is your responsibility to do so. Refuse to be led like sheep to the slaughter. Never for one moment forget that THERE ARE DARK FORCES ON EARTH which are the enemies of humanity. They will do whatever it takes to gain complete power over you. Do not assist them. You are on a precipice. These are difficult times. Do not make the wrong move. Use your conscience by going into your heart before taking any action. Do only what will assist your fellow man. Learn to distinguish between the lies which your governments tell you, and the truth. You are being bombarded by propaganda every day from the moment you wake up. Refuse to play their games. Your survival depends on you making the right decisions. By remaining silent, you assist your oppressors to destroy life on Earth. Research the bases in Antarctica that have been kept hidden from you. Research the origins of religion, as this will open your eyes. So much knowledge has been kept from you. Only the 33° freemasons are allowed to know. Ask yourselves why? Why do those who oppress you and hate you, have such power over you? The moment you wake up and become aware of this, you become a threat to their existence. They want the Earth for themselves. Please give some thought to what has been written here. My dear, progress is being made. Your efforts to free those who have been jailed to prevent their work, are important. Please continue to do so. Always, your adoring , Monty. Hello Offworlders! First of all let me say that the topic I’d like to talk about is not because I am depressed. I’m not. Yet, sometimes … and I have heard others express this also, everything seems a little bit pointless! I KNOW we are here to Love and raise the Vibration of ourselves and The Planet, yet STILL … the everyday conversations etc … just seem so trivial, when you consider what we are here to do. Any advice? Good day to you. Thank you for your consistency in bringing about thoughts that many humans have upon your Planet. We could not possibly consider such a thought, for nothing that we do or think or express in anyway, would be considered mundane or pointless. Well that’s the thing! I know I shouldn’t feel this way. I should make the most of everything and I try to. Yet, it doesn’t stop my underlying thoughts of ‘What’s the point of this ‘triviality’ … or thinking to myself whilst doing something with others ‘How is this enhancing our souls and indeed our Planet? A lot of activities or conversations do not seem to carry a High Vibration with them. Let us be polite, yet blunt with you Blossom. This attitude about things is brought about by you. This attitude is how you are CHOOSING to think. You COULD CHOOSE to completely change your thoughts around about any given conversation or activity … And make your entire Being … your Entire purpose for BEing here … be of GREAT JOY! This I also know. Yet … with respect … Life down here sometimes, ‘aint always sunshine lollipops and rainbows! Yet, if you chose it to be … it would be … no matter what the circumstance. All I am thinking right now is that one must have to be a highly evolved soul, to sift through the everyday mundaneness, or fruitless conversations in order to make every moment a joyous one. This is so. Up to you! Such hard work for the mind to continually be able to think like that. Sometimes, I just want to ‘Get off’! No offence to anyone … Yet, the point we are at on our Planet seems STILL to be that of trivial pursuit … Instead of joyous pursuit … and yet so many think that in searching for their joyous pursuit, they will find it in their trivial one! And who are you to say they will or wont? I am Blossom Goodchild, just here expressing how I feel at times. As I have said many time before, I have a blessed life and yet, quite often … I still question this Planet and all who sail in her! Yet you chose to be here. Dearest Light Beings … all these things I know … for we have spoken of them many times … and I am not saying ‘I know, I know, I know’, in a big headed manner. I am saying … that considering so many of us KNOW all this … that it is our choice of attitude etc … how come our minds still have these thoughts quite regularly of ‘Yawn yawn yawn’? We wish to speak openly with you about this subject matter . You are under attack constantly from those who ‘run’ your Planet. Under attack far more than you realize … and in many more ways than you realize. Many readers would want you to elaborate in what these methods of attack are? And for many reasons we do not desire to go into great detail. And you know many people will say you never answer questions properly … you dodge them … therefore; you are not ‘authentic’. (I know you to be Truth … I just like to be the advocate, so frustration can be kept to a minimum). Dearest one … we have mentioned many times that we are not here to impress. This is not a popularity contest. Souls either resonate with that which we speak or they do not. We have no agenda other than to serve in the Light. If it is at times, that we do not follow though intensely and with detail regarding certain subject matter … it is for a very good reason. Why ON EARTH would we desire to trick you? You wouldn’t but some express you can’t answer questions, you evade them because you are not of Truth. So I am just getting you to explain this. We come to assist. That which we CHOOSE to express is carefully collaborated so that these messages are received by ALL (and we mean ALL ) … and cannot get you into any trouble … If you understand . We think you do . Yes … to protect me. So back to us being under attack. Just how much does this affect our Being? To a large extent! Dampening your spirit so that you sometimes feel the way you do is part of the overall plan to suppress and bring discomfort in self. Yet, you are here to overcome that. It is at these times when you feel that all is so pointless that you must FIGHT BACK. For you know better. You know that it is just a breath and a thought away to make you change that which you are ‘fed’ … to a place of feeling so HIGH and so ON TOP OF THINGS … In an instant. You know this. Therefore, you can do this with the greatest of ease. Be aware when you have these thoughts, of what they are and where they come from and why you are having them. That knowledge, in itself can make you instantaneously overcome such thoughts and feelings. The more you have them … the more those who do not wish you to shine your Light are winning through. The more you change your thoughts … so simply, so easily … The more YOU … THE LIGHT … is winning through. Do you see? So simple Dearest Ones. I am known for sticking to something I have made my mind up to do. Sometimes, I need to discipline myself a little more than at other times. I guess it is a matter of making sure that this which you say, becomes a priority. To become more aware that when I have these thoughts … they are not coming from me … they are being sent to me … in ‘the guise’ of coming from me. Correct Dearest soul. And the more you choose to recognize this … the more you can CHANGE it. Why would it be that you … any of you … in your Light … would feel that everything is so pointless and that you want to leave the Planet? Just making it clear that I would never ‘take myself out’ … I just, now and then, want the next bus outta here. We understand. Yet KNOWING in fullness for self /of self … THE LIGHT YOU ARE … IN TRUTH … you KNOW why you are here. TO BE LOVE and raise the Vibration of self and all around you . What a wonderful way to spend every moment of your day! THEN … Dearest Ones, shall you FEEL the difference in WHO YOU ARE. When you feel WHO YOU ARE instead of TRY TO BE who you are … then shall the thoughts of triviality take but a Nano second of your time before they are dispersed … discarded. And how GOOD Shall you FEEL in this KNOWING … that in NO WAY are you letting those of lesser Light … those who choose to play a different game … take hold of your thoughts and bring you down to their level. YOU ARE POWERFUL MIGHTY BEINGS OF LIGHT. How we desire to get through to you on the deepest level, that by BEING the Light you are … you can overcome anything and everything! We are aware of unrest in many of your countries and there is much concern as to how it will all ‘pan out’. We say to you … let go of the concern … do not add fuel to the fire. Instead, add Light to the darkness and radiate your Light and Love into ALL situations that bring ill ease. THIS Dearest Ones … is how the situations shall be rectified. THIS … Oh souls of Divine Source … is how you bring your Planet back into balance. We have said there shall be much upheaval in order to eventually bring balance ‘Home’. THIS is when you come into your own. WE ARE HERE! WE ARE HERE TO BRING PEACE TO THIS PLACE. THIS IS WHY WE CAME AND WE SHALL … THROUGH THE HIGHEST LOVE LIGHT … FULFILL OUR DESIRES AND LET HARMONY REIGN ONCE MORE. THIS IS OUR VOW TO SELF AND ALL. Are you up for it Dearest Souls? Are you strong enough to see this through? Are you? Are you? Yes. We are! I feel it. I know it. For with your helpful messages, I am able to regain strength and KNOW that it is really very simple. Sure, it takes practice to remain in a vibration that serves at all times … yet it takes practice also, not to eat dairy or grain right now and because I set my mind to it … it’s just a matter of discipline! So … I just apply the same principles to my thoughts and feelings … and MAKE myself become who I Truly AM! And you know Blossom, that many would disagree with your wording … in that one shouldn’t have to MAKE themselves become themselves … for you just are. Yet, we agree with you … that due to common knowledge these days of suppressants to the soul from outsiders … one HAS to be stronger in their attitude and outlook. Yet, like anything … Practice makes perfect … and the more one practices, the easier it becomes. Until eventually, it takes no effort at all. Like riding a bike, as you would say. Yep, and I’ve fallen off mine many a time. And you got back on to regain confidence and prove to yourself you could do it … did you not? I did … and I could. Thanks Guys. As I said, we KNOW ALL OF THIS. We just … for some reason, need reminders and pointers and encouragement in these times. And we Dearest Blossom, are joyously happy to be the Ones to offer it to you … ALL. WE LOVE YOU. WE ARE ONE. AT the point of no return … Praise be! WE HAVE LIFT OFF. NO NEED FOR THAT DEAREST ONE … NO NEED FOR THAT. In LOVE and thanks . Loads of it. links: EE URIEL – Kreativität und Inspiration – Ein wunderbarer Tag um sich von den Engel inspirieren zu lassen und die eigene schöpferische Kreativität auszuleben! Tue heute was dir gut tut und Spaß macht…. male, tanze, schreibe, bastele, töpfere, stricke, häckele oder was immer dir auch gerade einfällt – TU ES! mitte: EE MICHAEL – Lösung karmischer Verbindungen – … denn genau durch dieses kreative Tun kommst du auch an tiefere Schichten in deinem Sein heran, die mit karmischen Verstrickungen verbunden sind. EE MICHAEL durchtrennt diese dann gern mit seinem Schwert. rechts: EE ZOPHIEL – Göttliche Synchronizität – Absolut! Alles geschieht dann, wenn es geschehen soll und es ist IMMER gut und richtig so für uns und unser Seelenwachstum! Vertraue also der göttlichen Führung und lass geschehen! Dir gefallen meine Videos und du möchtest deine Wertschätzung schenken? The Chinese New Year is now being celebrated, and it is once again the Year of the Rooster. I see this as a tremendously positive and powerful sign–a message of light and hope in this time of darkness. 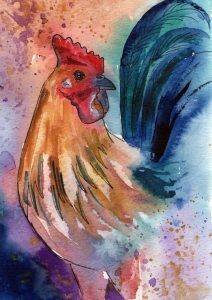 In honor of the rooster, I offer two stories that demonstrate how powerful and protective the rooster is–and how the rooster’s energy this year can lend us power and strength to drive back the dark. So now, pull up a chair by the fire, and hear two stories of roosters and their magic. “Run, run as fast as you can. Bringing yourselves to a new point in your evolution means that you step up to new sets of challenges. These challenges are what give you a reason to feel something. They give you a reason to summon forth energy. They give you a reason to make a choice. They propel you forward. Dieses Webinar dient dem erkennen, das sich über viele Inkarnationen hinweg durch erlebte Traumatas, gewaltsame Tode und z.B. Kriege Verletzungen im jeweiligen Mensch sein JETZT zeigen – auch wenn wir oft im Hier und Heute keinen Bezug zu dem erlittenen in vergangenen Leben herstellen können. Doch im feinstofflichen Körper sind noch Erfahrungen gespeichert, die durch einen tiefen Schock im Todesmoment oder durch schwere körperliche Verletzungen im damaligen Leben hervorgerufen wurden. Dies bezeichne ICH als Verletzungen der Seele – jedoch ist ja die Seele an sich unverwundbar. Dennoch sind diese “Blockaden”, die sich durchaus als körperliche Schmerzen zeigen können (wo mitunter kein Arzt eine Ursache finden kann) gerade jetzt in dieser Zeitqualität deutlich spürbar. Hier setzen wir gemeinsam in diesem Webinar an!